Want a durable and comprehensive rig ensemble without breaking the bank? 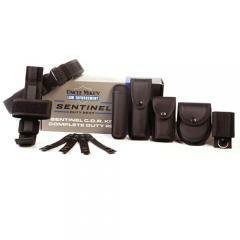 Uncle Mike's has developed the Sentinel Duty Rig Kit to fit the bill! The all-inclusive rig is constructed from ballistic nylon material and a molded foam frame for a tough and sturdy set of cases and holders that safeguard gear from daily wear and tear. The kit features a duty belt that comes in three sizes for waists ranging from 32-48 inches. Sentinel includes cases for an MK-III OC canister, a pager/pair of latex gloves, a 21-inch baton, one pair of handcuffs, a radio, keys and a Stinger flashlight (compatible with non-LED models). Uncle Mike's duty rig also includes four belt keepers to prevent rigs from sagging. This is one-stop shopping at its best! Note: Kit includes duty belt, belt keepers and holders/cases only. Gear items are sold separately. Snap system uses weaker metal but overall a great system. The time-saving function of this product is tremendous. Best for light duty use, however, the price is unbeatable. I was wondering if the cuff case that comes with this rig is a single or double cuff case. The cuff case that is included with this rig is a single cuff case. However, most of our double cuff cases are compatible with this rig.